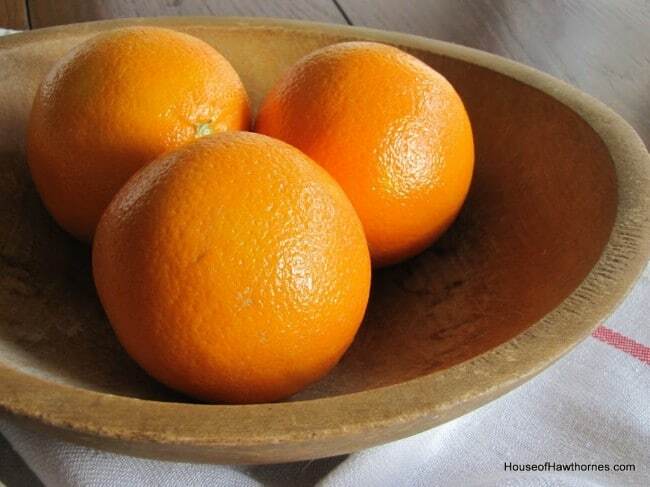 When was the last time you made cloved oranges? They are SUPER simple to make. 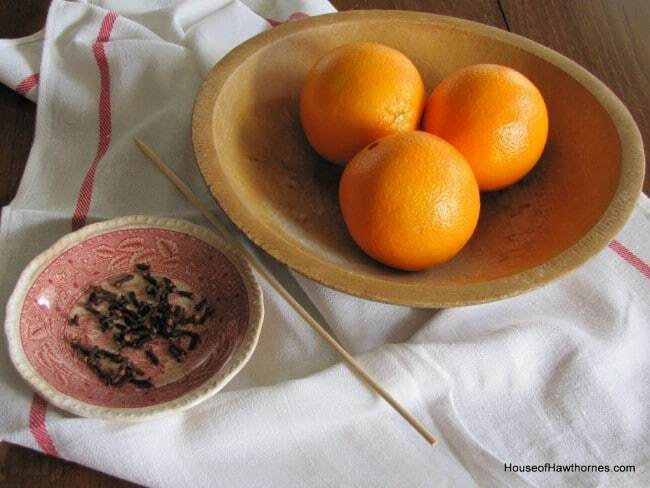 some oranges and a wooden skewer. I planned out an elaborate design for each orange, and then realized that oranges are round and it’s hard to make straight lines on a round item. So I opted for more simple designs. Really, you should have seen my depiction of The Last Supper that I was going to make on the oranges. 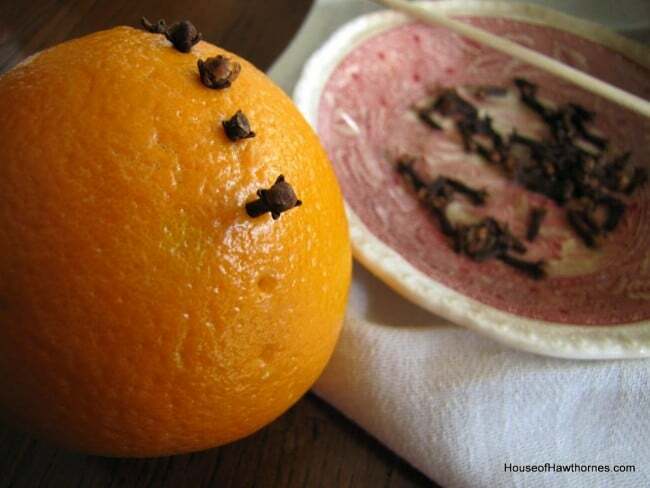 Just poke a hole in the orange and then push in a clove. 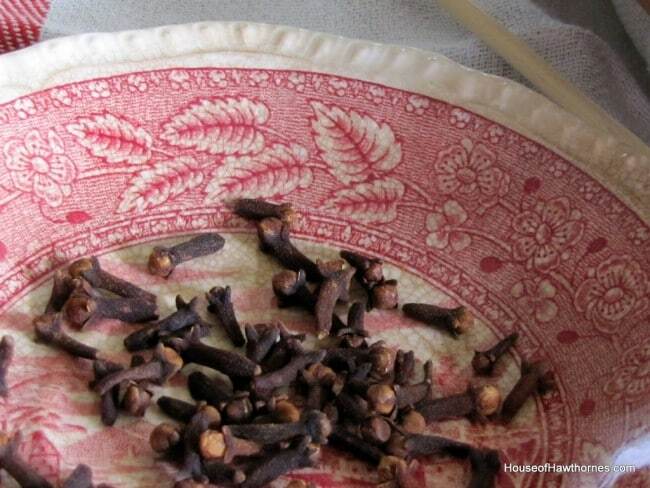 Cloves are pointy by nature, so you wouldn’t have to use a skewer to make a hole, it just saves you a little time to poke a hole first. The smell of the clove mixed with the juice of the orange is heavenly. Cloved oranges only take about five minutes each to make and the cost of three oranges and a can of cloves is around $5.00. Those Brownies know something about making easy and classic crafts. Edited To Add – I was wondering why cloved oranges don’t mold or attract gnats or anything like that, because I swear my mom used to keep hers for years. 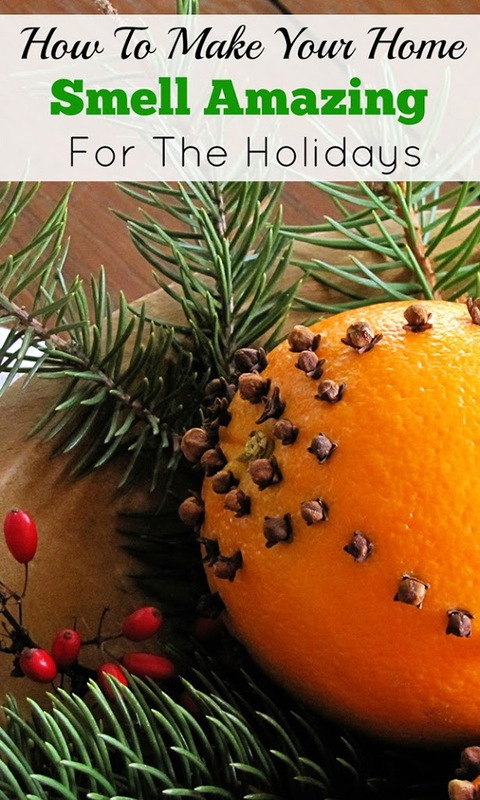 It appears the cloves help preserve the orange as it dries and acts as an anti-microbial. Cloves are one of the spices the Egyptians used for embalming, so I guess it makes total sense now. You Brownies are clever girls. I remember the wonderful scent back when I was a dinosaur. As a former Girl Scout, way back when… I admit to making this too. Thank you for reminding me that simple things can be more festive, than something you spend alot of money on. If I remember, the smell is heavenly. Take care. This is such a cute idea. I was just thinking about it yesterday, that’s so funny that you posted this. I wonder if it would work with little clemintines? I haven’t made any of the cloved oranges in years…sounds like this is the year to do them again! I would make these with my mom. The funny thing is, I can’t remember anything else that we made together. We would cover the orange and my fingers would hurt. Like your idea to poke them first. I can smell them through the computer. I remember my mom doing these one year at the holidays. Love that smell. Thinking a trip to Kroger is in order this afternoon! Enjoy. I haven’t made one of those in years!! Ooh, they must smell so lovely. I need to go check Aldi’s for oranges. I think I have some cloves already. Perfect Saturday project for WeeMan and I.
I love cloved oranges! We used to make one every year at Christmas time when I was growing up, but it’s been years since we made one. We used to attach some ribbon loops to the top and make it kind of like a kissing ball, so it could hang. My mom would hang it in a doorway, with a little bit of greenery so you could smell it when you walked into the room. I wanna see your take on The Last Supper lol!!! These look great. Too bad I quit Brownies or else I too would know how to make them! I love your new banner Pam. I sure do miss my red cardinals. They don’t have them here 🙁 ! Hope to do a post soon…if they ever let me out of work! You totally crack me up. This post is just what I needed tonight. I haven’t thought about clove oranges in a million years. Such a fun memory. 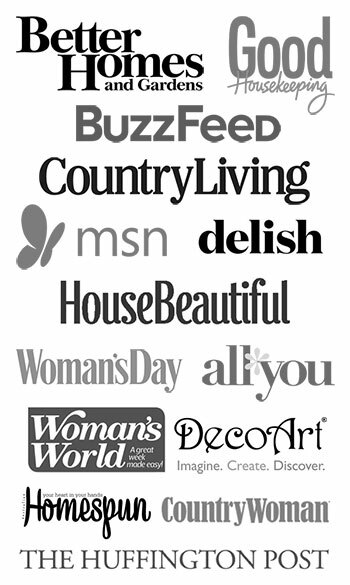 Your new blog header is divine. Beautiful images. Thanks for reminding me. I did these a few years ago. I can practically smell them from your awesome pictures. It’s my granddaughter’s turn for a sleepover tomorrow. This would be a fun project for us. so simple, so pretty. I have a bowl just like that sitting on my kitchen table…what a great idea! 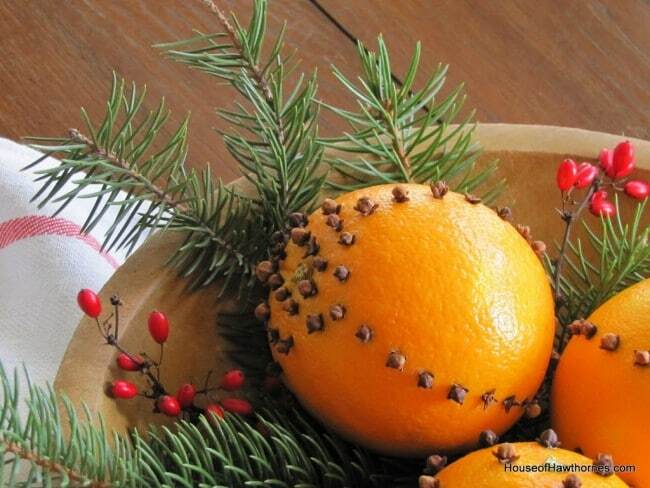 I love the smell of orange and clove, and the pine needles look so pretty next to them. I used to go to my sister’s house, and she would always have the smell of orange and clove in her kitchen. Made me feel so welcome. Mmmm I love that smell of the cloves and oranges. I may have to do some of those before Christmas. Thanks so much for your visit today. Me too!!! I can smell them all the way here, in NY. Great project. I have oranges set aside to make mine today… Yours are simply beautiful, and I love the way you’ve displayed them. Very Nice Post! Isabella and I will do this over the weekend I remember as a little girl always having cloved oranges, The scent amazing!! Please Come and enter in My 12 Days of Holiday Giveaways. 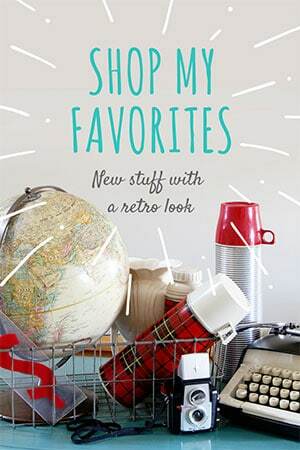 There are so many exciting & special Gifts! Tis the Season! These are so popular this year and I adore the look. I have to go see if I have some oranges…I love this idea! beautiful idea, look pretty, I never did, but it’s never too late…. I never did, but never too late.I’m going to try. I’m very excited to try this. thanks. Mmm…so pretty, festive and smells great from here Pam! They had oranges way back then?! Ha! Well, I guess so, you did say it was only 10 years ago. Only thing I remember from Brownies was someone taught me the wrong words to The Ants Go Marching 1 by 1. During our program everyone got quiet and I sang out to KISS HIS BEHIND on they go marching 9 by 9. I’m still scarred by that. I’ve never made these but I plan too now…I remember the wonderful smell. Do you remember the Brownie promise? Post the sketch for your Lord’s Supper. 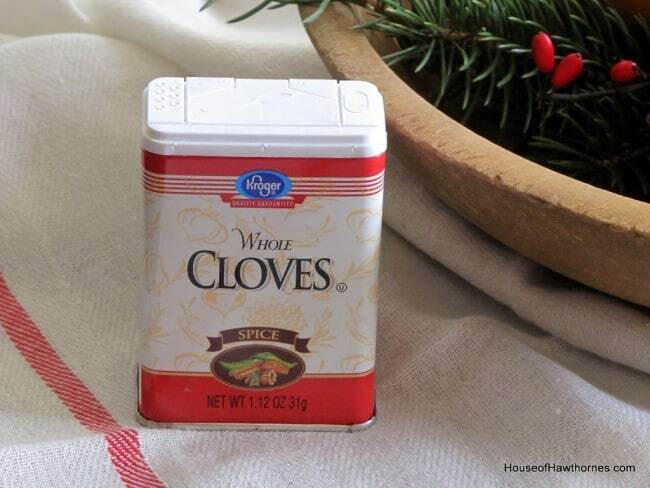 The cloves may be pointy – but the skewer saves your fingers! Also, makes it easier to do w/ little ones — I poke w/ the skewer & they put the clove in so much more easily. OR they poke w/ both skewer and clove! If making a design, it’s easier to lightly draw a design (simple or ornate) w/ pencil and use it as a guide (for yourself or for child). 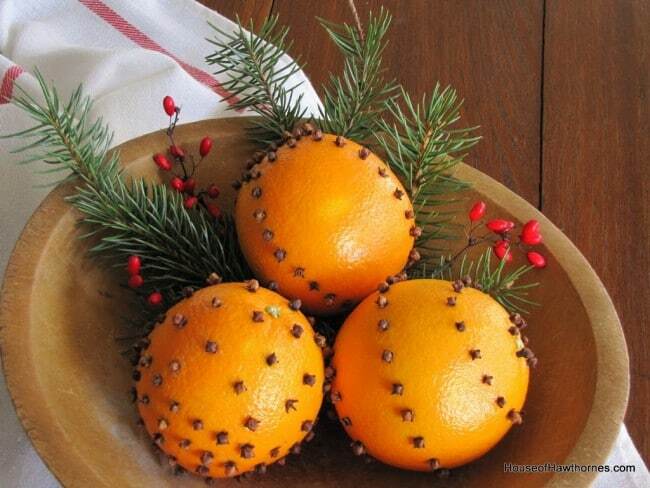 I love to make orange pomanders for Christmas. I remember making them in elementary school. And, you’re right. It’s easier to make simple designs, and use a skewer to make the holes. I make them almost every year. Love the fragrance. Happy Thanksgiving and Merry Christmas. We used to make these every year. Thanks for reminding me that this is just a great project for the holidays. I was just thinking of making orange cleaner, you know, with vinegar and orange peels. Anyways I wonder if adding the cloves to it would work too. I guess I shall have to experiment and see. Thanks for the idea. My husband decided he wanted to make one of these this year. I was out looking for directions and noticed I had pinned your post to my Christmas board – good timing. Howz about the, “Mona Lisa” alá Cloves? About to create some now! These beauties are one of nature’s perfect delights! OMG!! !…I was THERE when you sang that lyric, man!